During the 20th century, sea levels along the highly populated U.S. Mid-Atlantic coastline between New York and Virginia rose faster than in any other century during the past 4,300 years, according to a new study. And as those sea levels continue to increase as a result of global warming and local land elevation changes, the risks of coastal flooding will dramatically escalate. The study, by geoscientists at Rutgers and Tufts Universities and published in the new journal “Earth’s Future,” took a comprehensive look at the history of sea level in the Mid-Atlantic, combining sediment records of prehistoric sea level with modern data, which includes readings from tide gauges and satellite instruments. The result is one of the most in-depth examinations of past, present, and future sea level rise of any region in the U.S. 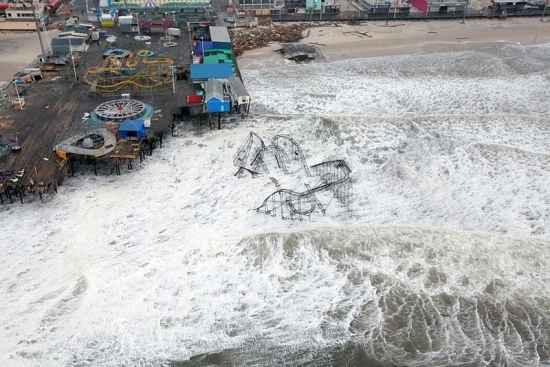 The amusement pier in Seaside Heights, N.J., was heavily damaged by Hurricane Sandy. Credit: Master Sgt. Mark C. Olsen, New Jersey Air National Guard. The study warns that regional planners will need to factor local rates of sea level rise when making decisions on building any long-lasting infrastructure, from water treatment facilities to Manhattan skyscrapers and Atlantic City casinos. For example, the study estimated that the New Jersey shore will likely see a sea level rise of about 1.5 feet by 2050, and about 3.5 feet by 2100, at least a foot higher than the average global sea level rise over the rest of the century. Using a middle-range scenario for future sea level rise, the study found that by 2050, flooding caused by a 10-year storm, which has a 10 percent probability of occurring each year, would exceed all historic storms in Atlantic City. 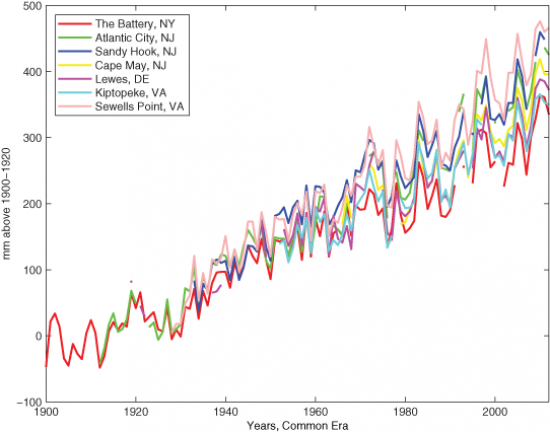 According to the study, relative sea levels in the Mid-Atlantic region rose at about 0.10 inches per year during the 19th century, and that rate accelerated to 0.15 inches per year during the 20th century. That may not sound like much, but it is already enough to make a major difference when storms strike. The impact from Hurricane Sandy clearly illustrates that. The study found that a 7.87-inch global sea level rise during the 20th century, which was largely driven by manmade global warming, caused Hurricane Sandy to flood an additional 27 square miles compared to what it would have if the storm had struck in 1880 when sea levels were lower. Using figures from Climate Central’s sea level rise database, the researchers (who were not affiliated with Climate Central) found that sea level rise exposed an additional 83,000 people to coastal flooding, with about 45,000 in New York City and the rest in New Jersey. While two factors largely control global average sea level — temperature and variations in the volume of the Earth’s ice sheets and mountain glaciers — local rates of relative sea level rise are more complicated. While the U.N. Intergovernmental Panel on Climate Change (IPCC) projected that global mean sea level rise for 2081-2100 will likely be between 10-to-32 inches, those numbers mean little to local policymakers, who must make decisions based on local sea level rise rates that often differ from the global average. Those differences are the result of several factors, including ocean currents that can cause faster or slower rates of sea level rise in some areas, groundwater depletion, which can result in sinking land, and gradual post-ice age adjustments of the land. In the Mid-Atlantic region, it turns out, all three of these factors are conspiring to accelerate sea level rise. Every part of the region saw the level rise at a faster rate than the global trend, the study found. In fact, that rate since the early 1900s was nearly double the global average. Locations that sit atop a coastal plain, such as the Jersey Shore, are seeing the fastest rates of sea level rise compared to those Mid-Atlantic coastal locations that are built on top of bedrock, such as New York City, since the geology of the coastal plain features more settling of the land from groundwater depletion and long-term sediment compaction. Other studies have also identified the Mid-Atlantic as a so-called “hot spot” of sea level rise, but the new research provides more statistical proof that modern sea level rise in this region is outpacing even periods from several thousand years ago. “The study highlights the importance of geological data when making predictions for coastal inundation during the 21st century and that it is important to take a regional approach,” Simon Engelhardt, a professor at the University of Rhode Island who was not involved in the new study, said in an email. Click image to enlarge. Credit: Miller et al. 2013. To put recent rates of sea level rise into historical perspective, the study found there is at least a 95 percent probability that the rate of sea level rise in the Mid-Atlantic during the 20th century was faster than any century in the past 4,300 years, and a 67 percent probability that it was faster than any century in more than 6,600 years. “The sea level rise that we’re seeing now is very significant,” including in a “prehistoric context,” said study co-author Ben Horton of Rutgers University, in an interview. The study projects that lower Manhattan will see about 8.6 inches of sea level rise by 2030, 15.7 inches by 2050, and 38 inches, or just more than 3 feet, by 2100. The 15.7 inches of sea level rise by 2050 would be sufficient to transform what would be considered a moderate 10-year storm today to reach the same flood level as a 100-year storm would. The higher-end scenario considered in the study would bring 5.5 feet of sea level rise to Lower Manhattan by 2100. That would cause a 10-year storm event to bring flooding comparable to Hurricane Sandy, which brought the highest storm tide on record to Lower Manhattan. Every subway tunnel connecting Manhattan with Brooklyn and Queens flooded, along with transit stations in adjacent areas of New Jersey and all three of the city's major airport hubs. A separate study published in 2012 found that similar increases in storm surge risk would occur at many other coastal locations in the U.S. Assuming continued groundwater extraction rates at coastal plain locations, those areas would see a greater amount of sea level rise, the study found. The study projected that those areas could be in for a rise of 9.8 inches by 2030, 1.5 feet by 2050, and about 3.5 feet, by 2100. While the study shows that the main component of future sea level rise will be from global sea level rise, local land elevation changes should be factored into development decisions, since they will influence the rate and extent of relative sea level rise at the local level. The study noted that there are currently limited tools for policymakers to use to factor in sea level rise to the planning process. Even the Federal Emergency Management Agency’s newest flood elevation data, released this year and used to help determine federal flood insurance requirements, failed to include sea level rise projections. “They are accordingly relevant to insuring against current risks but do not provide appropriate guidance for long-term planning,” the study said.